“I hate to hide things away. Western thinking is that a museum collection is for the public benefit, and it's anathema to deny them access. But there are different rules up here”. Pierre Arpin, a French Canadian by birth, is the beleaguered Director of the Museum & Art Gallery of the NT (MAGNT) in Darwin. The newish Country Liberal government handed him a 10% budget cut in its December budget, leaving him without funds to replace curators – in particular his Indigenous curator – the librarian and registry staff. When does a Museum cease to become a functioning museum, one wonders? However, almost at the same time, the NT Aboriginal Areas Protection Authority was handing down a report about the 226 early Papunya boards held by MAGNT – the only ones bought at the time in the early 70's by a public institution when they were hot off the press down in the Desert, and about a quarter of all that were ever painted – which have become known as the “Foundation documents of Aboriginal art”. It cleared 163 for public showing - which should have inspired a fully-functioning MAGNT to dynamic activity. Instead, a lightweight outing for just eight of the boards was unveiled in Alice Springs last Friday – more of a Ministerial stunt than the artistic event it should have been. But what, you might ask, was a land-based body like the AAPA doing with the moveable artworks which make up the MAGNT Collection in the first place? The answer is both political and a reflection of the way in which Aboriginal people are reclaiming control over artworks that were made in days when the power balance with white Australia was so different. Two things occurred in 2009 that helped to tip that balance. A minor factor was the replacement of one Aboriginal Minister in the then-ALP NT Government by another. Marion Scrymgour, from the Top End had announced funding for the little-seen treasure trove of boards to be conserved, shown and possibly toured overseas. Her Desert successor, Alison Anderson – a painter herself and a descendant of both Long Jack Phillipus, the only surviving artist from 1971, and Old Bert Tjakamarra, a key elder in this whole business – cancelled the money and impounded the boards, mainly because of events in America. For there, an American couple, the Wilkersons, wanted to show off their recently acquired collection with a tour of university art museums. The 'Icons of the Desert' exhibition had a weighty catalogue which contained multiple interpretations of its 50 artworks – up to three for a single board - all in the words of white facilitators such as Geoffrey Bardon, who first encouraged the painting at Papunya but never mastered a Desert language, also the Alice Springs dealer Pat Hogan. Minister Anderson was outraged, talking about “people with no culture stealing our culture”, and was insistent that no boards be seen until all had been checked over and interpreted by a group she called the Contemporary Cultural Custodians. Three years later, they have declared that 63 have “gender-based restrictions, and should not be available for public display”. Even some of the 163 'open' boards will have restricted interpretation. It's hard for non-Indigenous people to get their head around the idea that because a tribal woman, an uninitiated Aboriginal man or a child might be endangered by seeing something, then we who are almost completely unable to read meaning into the imagery must also be denied sight of it. It's a lot easier to understand that the level of interpretation should be controlled by those who really know, who can judge between what will encourage an appreciation of the complexity of Aboriginal culture and what is matter that should never be revealed to the uninitiated. 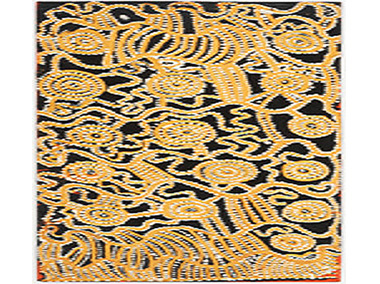 The trouble is that in 1971, an artist like Kaapa Mbitjana Tjampitjinpa felt he'd been given the go-ahead by his Anmatyerre/Arrernte elders to reveal secret imagery as a way of proving to white Australia that the people it had disregarded under the notion of Terra Nullius actually had complex laws and belief systems that should never be assimilated into the dominant society. That battle still goes on. But, by late in 1972, tribesmen who shared the Luritja, Arrernte, Warlpiri and Pintupi Dreaming stories – especially the Pitjanjtajarra - were aware that secret/sacred matters were being put before the world and sold for as little as $25, and objected forcefully. The artists responded – some using the now-familiar dotting to cover up important detail, others restricting their art to the more open Tingari subject-matter – often creating ever-larger mosaic-like works, now on canvas. Ironically, few of the controversial boards were snapped up by a market that either continued to disregard the very idea of Aboriginal culture, or felt that it could only be of ethnographic interest – the story – incapable of aesthetic appreciation. That's a battle that continues too! But at least Robert Hughes, from his eminence in New York, would come to recognise “The last great art movement of the 20th Century”. It's not as though these Foundation Documents haven't been seen at all. 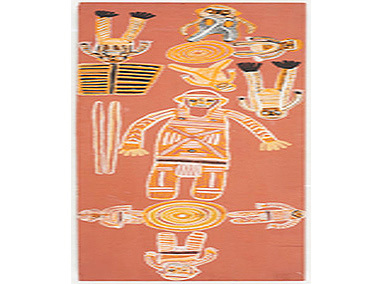 Although MAGNT has always been constrained by space and ambition, it did actually put up its first show of boards in Darwin in July 1971 under the intriguing title: “Symbolic Paintings Derived from Sand Paintings and Drawings by the Pintupi And Warlpiri Artists from the Settlement of Papunya”. Since then there have been more sightings overseas than in Australia. Here, the market played a significant role in the late 90s – with auction house Sotheby's uncovering caches of boards and marketing them both cavalierly and internationally. 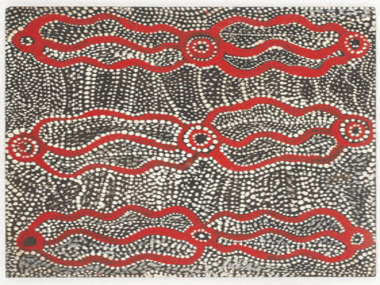 Prices reached $440,000 for a Johnny Warangkula 'Water Dreaming'. State galleries have also covered the area – notably an uncautious 'Genesis & Genius' at the AGNSW in 2000, and 'Tjukurrtjanu/ Origins' at the NGV in 2011 – a 40th anniversary project, already aware of sensitivities out in the Desert, involving both obtaining approvals and putting a section of the show in a closed room. That way they hoped that the uninitiated tribal people visiting Melbourne for the show wouldn't be endangered. But that sort of care may not be sufficient in the future. When the AAPA report came out last year, it was received by the same Alison Anderson who, as an ALP Minister, had commissioned it. Now she's the Country/Liberal Minister for Indigenous Advancement. And her website makes clear that she sees the lengthy protocols involved this time as applicable to much more Aboriginal art and artefacts currently shown in galleries and museums across the country. Here's what she said: “This is a good model for others to follow. Too often in the past, exhibitions of desert art have been done the wrong way, with bad consultations, and with non-indigenous or non-traditional advisers calling the shots. But we have shown the right path. This is the way it should be, and must be, from now on, if we as a nation are to be able to hold our heads high and say we truly respect Aboriginal traditions. There have been dreadful travesties committed before in the name of art, because museums and galleries have been too eager to have their time in the sun. We have gone down a different road, here in the Territory, and reached a good outcome. I urge other galleries and museums to learn from MAGNT, which can now take its place as the repository of the largest and most valuable holding of early desert boards in the world”. Interesting comment there - “non-traditional advisers”, which would have to include most of the Indigenous curators in the country's major art museums, are lumped together with “non-Indigenous advisers”. But there were more positive thoughts at the end about revealing at last the true strength of the MAGNT board collection. At the moment just eight of the works of the late Papunya masters Mick Namarari, Old Walter Tjampitjinpa, Uta Uta Tjangala, Charlie Tjarura, Shorty Lungkata, Johnny Warangkula, and the only survivor, Long Jack Phillipus are on show at the Araluen Art Centre in Alice Springs all this year; and Minister Matt Conlan – Arts and Tourism – is linking his portfolios by putting photographic copies in the Aboriginal-owned Ayers Rock Resort. To be honest, it seems more of a Tourism than an Arts display. Even Pierre Arpin – who made the selection – calls it “just an appetiser”. But Alison Anderson is clearly intent on getting the main course of 163 cleared boards into a dedicated building in the Red Centre – in Alice, or it could even be out in the Desert where the boards came from – in some financially improved future. Arpin talks of a catalogue raisonee and international touring; Germany, the US and Canada have all expressed interest, despite the fact that the NGV has beaten the NT to it with its Tjukurrtjanu exhibition now in Paris. He also revealed that the AAPA report – the full version of which can only be read by initiated men – does recommend reviewing the position of the 63 restricted boards every five years. It also leaves open the possibility of showing those restricted boards overseas – though that raises the issue of the Icons of the Desert catalogue, which had to be published with some images blacked out in case it fell into the wrong hands in Australia. A supplement showed those boards in the US. I hope I'm not being unfair to him, but Pierre Arpin's selection of the eight boards by seven artists - two from Mick Namarari - seems just a tad random, though not inappropriate. They were simply the ones that took his eye as they were being sorted into 'open' and 'closed' – the latter were then locked away. But Namarari did prove himself a serious artist over the years, was the subject of a Geoffrey Bardon film, 'Mick and the Moon', and won the 1991 National Aboriginal Art Award, as the NATSIAAs were then called. Old Walter Tjampitjinpa was the patriarch – probably born as early as 1905, and the senior custodian of the Water Dreaming. But this was most famously painted by Johnny Warangkula, once a labourer of airstrips and roads in the desert. When asked in 2000 how he felt about his masterwork representing that Water Dreaming selling for $440,000, he famously responded: “Save your pity for those who have no Dreaming”. Charlie Tjaruru (Tarawa), who'd worked with prospectors and would later perform in Holland with the extraordinary Marina Abramovic, explained his need to paint,”If I don't paint this story, some whitefella might come and steal my country”. Uta Uta Tjangala was one of the first to paint in 1971, was master of the Umari site, won the first NAAA in 1985 and had works in the Sao Paolo Biennale in 1983. Shorty Lungkata was the Blue Tongue Lizard, by name and by artistic subject – a senior Pintupi rites man and dancer. And that great survivor, Long Jack Phillipus – now 81 or 2 – is also a Lutheran pastor, and was the first to move to canvas from those famous building blocks of Aboriginal art, the boards.